Saturday, April 13 Fontevecchia the Association will be in Naples, at the invitation of the associations I Seats in Naples and Agora during the performance of "The Passion of Cortona in the intonations of Laudario 91 of the thirteenth century" that It will begin at 18.45 in San Paolo Maggiore in the central Piazza San Gaetano. 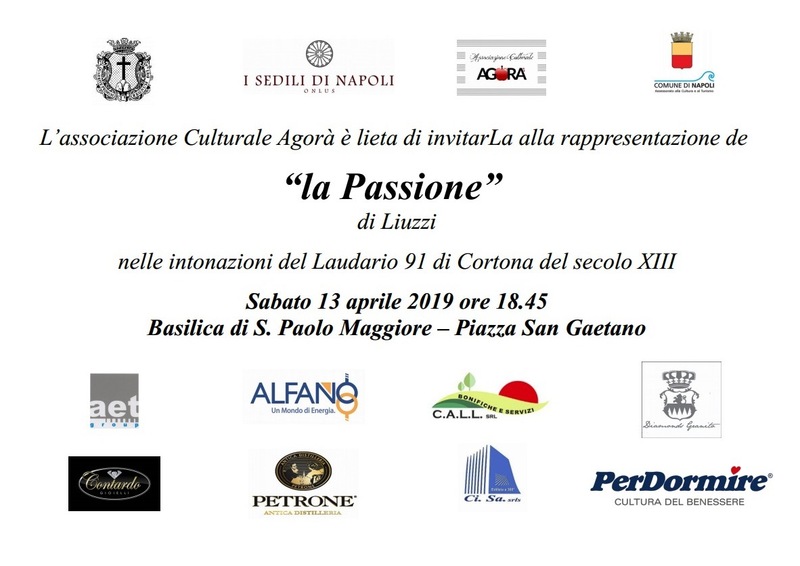 A most welcome invitation that testifies to the intense relationship of cultural exchange between Abruzzo and Naples, between the Association and those Fontevecchia Neapolitan leader in organizing cultural events. But what is The Passion in the intonations of Laudario 91 Cortona? "The 1200 was a century of great religious fervor, it is during this period that many movements come to life marked by the rediscovery of the apostolic life and evangelical preaching that could reach the working classes; the Church he hampered and repressed these movements, judging heretics, but could not stem the artistic expression in musical and literal field gave birth to paraliturgical compositions in the vernacular of popular character, like the hymn. If in a literal field can not but think of the poems of Jacopone, the repertoire can not be separated from the Laudario study of Cortona. Rediscovered only in 1876, presumably it dates back to the period between 1270 and 1292 and collects the poems of different poets and musicians; along with Laudario Magliabechiano is counted among the first evidence of Italian music in the vernacular and the first collection of Italian laude with musical notation. It was Fernando Liuzzi (1884-1940), composer and musicologist, and passionate about medieval music, transcribe the entire collections from square notation to modern notation, even enriching, following the fervor of the nascent musicology, with a rich orchestration that approached the modal writing medieval ear of the late nineteenth century tone. From the vast work of transcription Liuzzi he made a fifteen Laude cycle consists of the Nativity, the Passion and Resurrection, which gave the prints in Rome with the title of "The Passion of the century in the intonations of Laudario 91 Cortona XI".